In one of this week's more interesting stories, a website-based consortium has agreed to take over a non-league football club. 20,000 members of the MyFootballClub website each paid £35 towards the idea that they would, one day, buy a football club. And it's emerged that the resultant £700,000 kitty is to be used to buy up Blue Square Premier (formerly the Conference) outfit Ebbsfleet United. MyFootballClub launched in the Spring - the idea being to bring democracy to a small football club - a world away from the corporate interest of the Premier League. Each of the 20,000 members will own an equal share of the club and can vote on transfers and other issues. Will Brooks, the creator of MyFootballClub told The Guardian that the site had conducted talks with other clubs. "Nine football clubs approached us and we believe that Ebbsfleet is the right choice," he said. "We hope that MyFootballClub members and Ebbsfleet supporters will join forces to make the football club more sustainable and successful." 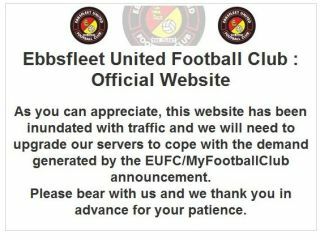 If you're a football fan yet you haven't heard of Ebbsfleet, that's because the club's name was changed in May after a regeneration of the local area - it was formally called Gravesend and Northfleet. They are currently challenging for a play-off spot for promotion to Coca Cola Football League Two. One of the most interesting parts of the deal is that the stakeholders will have an opportunity to play a part in team selection. "During and after matches, Ebbsfleet supporters often give me their opinion on which players should or shouldn't start games. Now they can have their say," Daish told BBC Sport. Traditionally managers demand autonomy, but Daish seems happy. "My job won't change that much. As a club, we'll select the starting 11 players and formation together. But just as before, what goes on at the training ground and in the dressing room on the day of the match is down to me." We are united in believing this is a great opportunity," Ebbsfleet chairman Jason Botley told the Beeb. "This extra finance and support will enable our club to progress." It seems the current management will continue their roles at the club including manager Liam Daish. "As a football fan, I think the idea is fantastic," Daish was reported as saying in this morning's Guardian. His job title will change after the takeover to become head coach. "I look forward to the challenge of working with thousands of members to produce a winning team." The deal is expected to be completed in the coming weeks after due diligence processes have taken place. The consortium will have a 51 per cent stake in the club, with the option to buy outright in future. Oh, and should the club get into financial difficulty, the individual investors won't be affected - the Financial Services Authority has approved the creation of a Trust to run the club.